» Where did Viva Cards come from? Where did Viva Cards come from? Over ten years ago, after four hard years of slog, I sat my own PhD viva. If I’m completely honest I didn’t know how to prepare for my viva, and there wasn’t a lot of support available (this was the days before social media or online discussion forums) so I just recovered and relaxed for the first couple months and then set about re-reading my thesis and annotating it, covering it with stickers and post its. On the day I found the viva to be a much more positive experience than I’d imagined, however it was unbelievably stressful entering a room without being confident I had done the right preparation. I’ve written about that experience in more detail before on my personal blog. What has that to do with Viva Cards I hear you ask? Well that sense of having been underprepared stayed with me and I made a point of trying to support other friends and colleagues as they approached their own vivas. 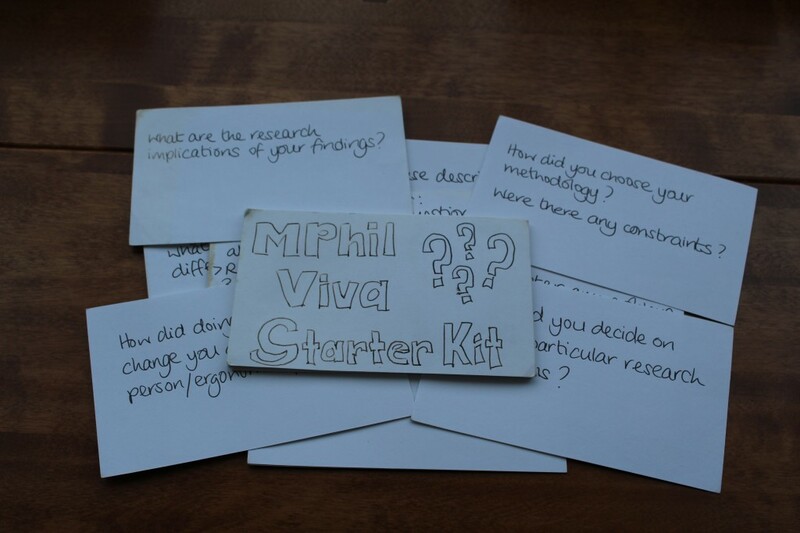 Then a couple years ago I produced a first set of written prompts, on record cards, to help a friend prepare for his MPhil Viva. Since then I’ve made several sets of cards for people, all of which have been received with great enthusiasm. More recently people started suggesting that I publish them. So, here we are, with the first version available.